The surface roughness of nozzles has important influence on the quality of fuel atomization. The diameter of nozzles in aero engine is generally less than 1 mm. Because of the smaller diameter of the grinding wheel used, its stiffness is poor and thus the wheel tends to deflect under the grinding force. The deflection of grinding wheel has great influence on the actual feed, which ultimately affects the roughness. Therefore, a predictive model of the roughness during internal traverse grinding (ITG) is thus needed. Such a predictive model was established in this paper, in which the deflection of tool and interference of grooves were taken into consideration. In addition, the relationship between roughness and various input variables, namely, the rotating speed, the oscillation speed, the radial feed speed, the feed time, and the spark-out time, was established. 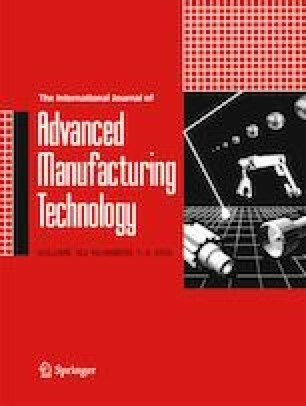 Then several groups of experiments with different input variables were carried out to calibrate and validate the model, which demonstrated that the predictive model of surface roughness of ITG in small-hole nozzles has good accuracy, and provides guidance for the optimization of processing parameters. This research was supported by the Fundamental Research Funds for the Central Universities of China (NO. NS2018031).